Episode 18 ~ Do Androids Dream of Tofu Lamb? The crew gets together for episode 17. Geronimo, Jason, Joshua, and Nick spend time talking about Fallout 4, Battlefront, and Mass Effect: Andromeda. But as is the Scattered Afterthoughts way, the quartet spend most of the time debating the purpose of Taco Bell and exploring romance in video games. Of course, the crew wouldn't dream of losing a chance to talk about chassis, or knickers for that matter. So sit back, relax, and try to keep up. Episode 15 ~ Welcome Back!!! The boys are back! 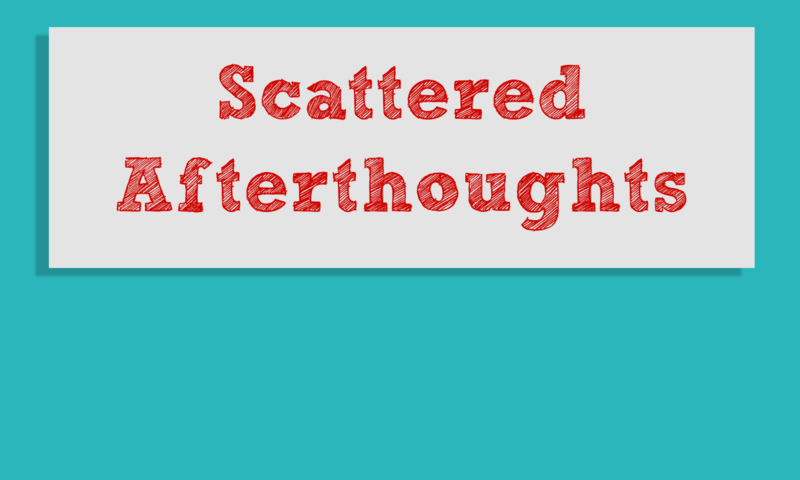 In this episode, it's a medley of guests showing off the new format for Scattered Afterthoughts. The 13th episode of the Scattered Afterthoughts podcast. We talk about Wind Waker HD and many other cool topics. The Christmas Special of the Scattered Afterthoughts podcast! We hope you enjoy and have a very merry Christmas, and a happy new year. In this episode, Geronimo, Jason and Joshua discuss their excitement about Dishonored, Assassin's Creed III, Halo 4, as well as their thoughts on the inevitable Batman reboot and Justice League movie and the greatness that is Sherlock. Plus, a holiday announcement!